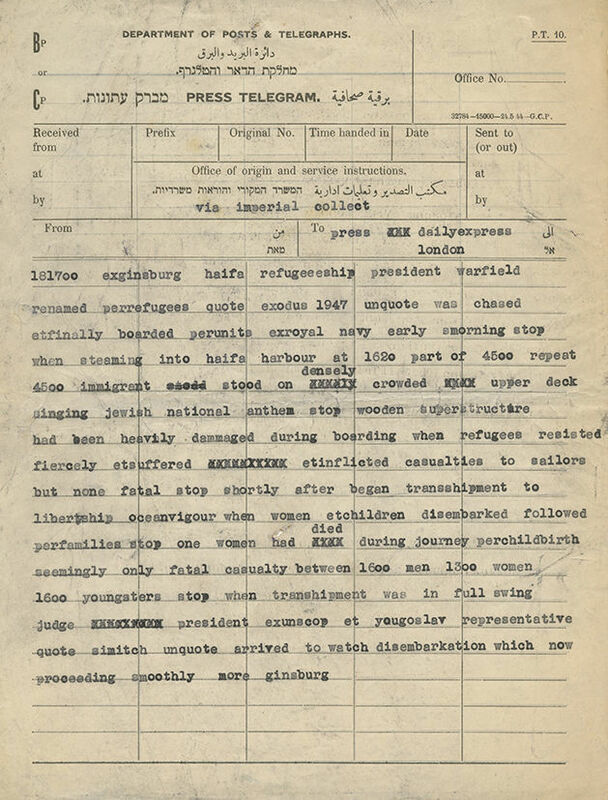 Press Telegram sent to the editorial of the Daily Press in London upon the arrival of the illegal immigrant ship Exodus in Haifa port. . English. The telegram, written by an English journalist, describes the arrival of the ship Exodus and the boarding of immigrants on deportation ships: "Part of 4500 repeat 4500 immigrants stood on densely crowded upper deck singing Jewish national anthem… shortly after began transshipment to… Ocean Vigour… [one of the deportation ships to which deportees were transferred in Haifa port] one woman had died during journey". leaf, 26 cm. Good condition. Stains and creases. A few tears, some reinforced with adhesive tape on verso. Enclosed is a receipt for delivery of the telegram from July 18, 1947.